Digital Branding, Responsive Design & Strategic Content Marketing Empowers Mobile Device Enterprise Security SaaS Innovator to Accelerate Its Sales Cycle at Go-To-Market Launch. enterprise mobile device management solution to discerning audience in the intelligence community. KiteWire is leading Mobile Device Enterprise Security Management SaaS, which counts amongst its clients major intelligence, defense and justice agencies that need robust intrusion prevention and resilient cybersecurity protection. When the entrepreneurial founders and management of KiteWire were planning to bring the industry’s most advanced mobile device management solution, Steel Talon, to market, leaders engaged Borenstein Group with developing a compelling go-to-market brand message and an engaging brand identity, along with an innovative digital marketing presence to support the highly targeted launch. Leveraging its proven B2G branding experience in communicating effective messages to senior decision makers in the defense and intelligence communities, the Borenstein team knew the Steel Talon message had to be hard-hitting and concise. Since the Steel Talon product is highly innovative, the user experience needed to match. After conducting a competitive brand review, key interviews with KiteWire’s innovative technologists and business developers, Borenstein design a new product logo, consistent with the KiteWire brand, but bold and distinct within the industry. Then, Borenstein’s digital creative team designed a fully responsive, vertical-scrolling website with interactive points of engagement and unique parallax scrolling effects that provide a cutting-edge interactive browsing experience. 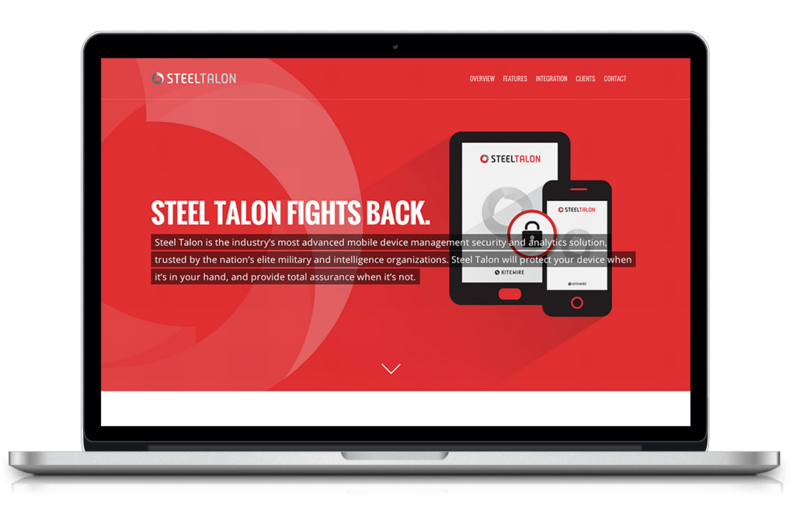 By taking users on a journey through Steel Talon’s features, the site communicates the urgency and necessity of the solution’s enterprise grade mobile security and data analytics. 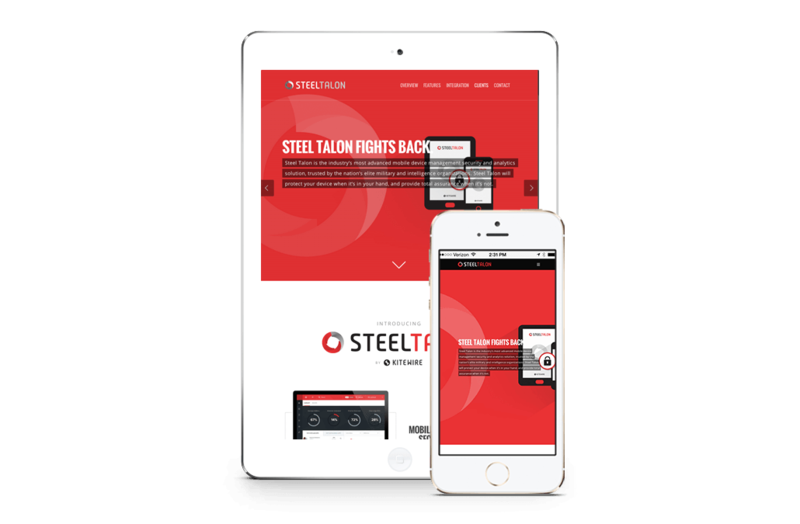 The visuals and content convey Steel Talon’s mobile device management capabilities in a compelling way. Further, to reach target audiences using the full 360 degrees of B2B media, Borenstein Group created a series of print and digital collateral pieces to showcase individual Steel Talon service tiers, ultimately calling readers to take action. 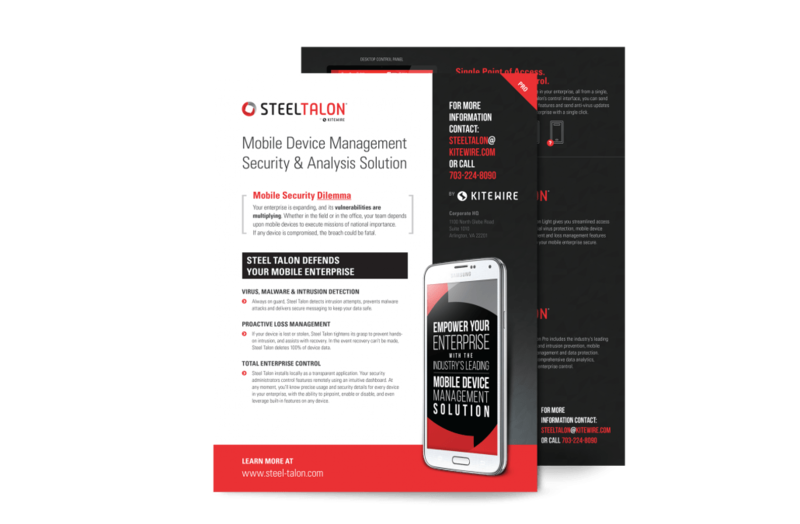 Thanks to Borenstein Group’s strategic marketing knowledge and creative delivery, KiteWire’s innovative Steel Talon mobile device management product has a high-impact digital brand to effectively showcase the solution’s advanced capabilities. The targeted messaging positions Steel Talon as the solution of choice for organizations that demand the utmost in resilience and enterprise mobile security. Thanks to Borenstein Group, Steel Talon is poised to tighten its grasp on the sensitive mobile data that matters most. Founder & CEO KITEWIRE Inc.